This Thursday, Nov. 22, will be the American holiday Thanksgiving, a celebration of giving thanks over a traditional meal shared with family and friends. While this holiday admittedly isn't regularly celebrated in Turkey, there are a few upscale dining options and entertaining get-togethers that may be of interest to expats feeling homesick this week. 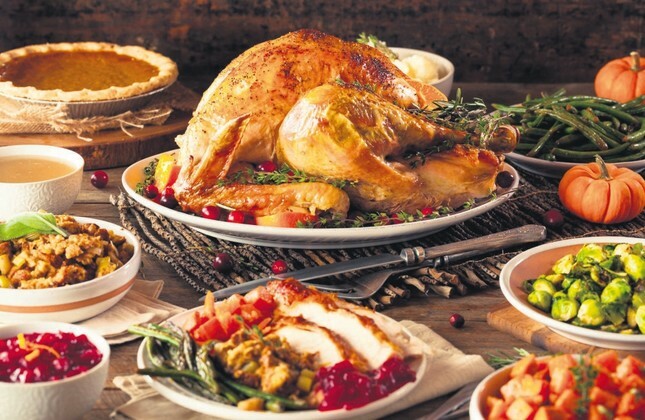 A popular spot for elegant holiday meals among the expat community due to its iconic location in Harbiye and offering spectacular views of the Bosporus, the Hilton Istanbul Bosphorus will be holding both a Thanksgiving brunch and a dinner buffet on Thursday, Nov. 22. The open buffet will have a roast turkey carving station with all of the traditional trimmings as well as other entree options including a seafood grill, Turkish mezes and delicious desserts as both a brunch or dinner option on Thanksgiving day. There will be live music and a kids food court and a designated play area, with toys and entertainment for the young ones. The brunch will take place from noon to 3 p.m. and dinner will be served from 7 p.m. to 11 p.m. The cost is TL 195 ($37) including a drink or TL 245 for unlimited domestic drinks. The cost for children is TL 135 and free for those under the age of six. The Conrad Istanbul Bosphorus in Beşiktaş will be hosting a traditional Thanksgiving dinner that will take place on the evening of Thursday, Nov. 22 from 7:30 p.m. to 11 p.m. Held at Manzara Restaurant, which has spectacular views, there will be an elegant buffet dinner accompanied by a live piano performance. The cost is TL 195 and includes unlimited local drinks and a 50 percent discount will be applied to kids aged 6 to 12 and free for children under 6. Also of interest, the Conrad Istanbul Bosphorus also hosts a special talk series that will be taking place the following Thursday, Nov. 29 from 7 p.m. to 9 p.m. Titled "Ekololjik Duyarlılık," this special free seminar will focus on ecological sensitivity from a variety of angles. The guest speakers at this interesting talk include a pop star, a wine producer, a painter, a vegan author and a member of the Roma Bostanı community garden. Yabangee is a volunteer-driven English website and community platform for foreigners living in Turkey that also hosts a series of events. If you are looking for something less traditional, on the evening of Thanksgiving they will be hosting a "Great Gatsby Night" at Beat, which is located on Yeşilçam Street in Beyoğlu. A celebration of jazz and the roaring 20s, there will be surprises for those who dress appropriate to the era that the well-known literary character was spawned from. Entrance is free and drinks will be half off until midnight. The doors will be open from 10:30 p.m. to 4 a.m.
A day prior, on Wednesday, Nov. 21, Yabangee has also organized a special get together for English-speaking professionals. Titled "After-work Networking Social," the event will be taking place at KiKi in Cihangir, a popular venue known for showcasing talented DJs. The event will begin at 7 p.m., and there will be a number of networking activities to enable participants to meet other professionals in the city. On Friday, Nov. 23, Pop-Up Dinners Istanbul will be organizing a special tour of the historical Four Seasons Hotel in Sultanahmet, which was once an early 20th century prison and the first of its kind in the city. Afterwards, participants will feast on the hotel's special cheese tasting event, which also includes pizza and risotto. Run by Kay, a Singaporean-Dutch former restaurateur and long-term Istanbul expat, Pop-up Dinners Istanbul hosts a wide variety of themed dinner events that for years have become a popular meeting grounds for members of the expat community. The following week on Friday, Nov. 30, Pop-Up Dinners Istanbul will be hosting "Ethiopian II Pop-Up." Back by popular demand, Kay will be cooking up a storm and serving a wide variety of Ethiopian dishes such as Shiro Wat chickpea stew, potato and spinach balls and Injera pancakes. The main course will be the chicken dish Doro Wat, cooked with Berbere spices and served with rice and for dessert there will be a cardamom cake with Ethiopian coffee sauce. Kay's pop-up dinners are typically held in her home in Cihangir and take place from 8:30 p.m. to 1 a.m. with Ethiopian coffee sauce and cream. "Black Friday" falls on the Friday after Thanksgiving and is considered the biggest shopping day of the year in the U.S. As a result, impressive discounts are rolled out on this day, which falls on Friday, Nov. 23 this year, and shoppers scramble to take advantage of the offers. While this can be a daunting experience in the U.S., in Turkey, it is a lesser-known popular culture phenomenon; however, many brands and retailers will also be offering significant discounts on the day, which is referred to as "Kara Cuma'" or "Efsane Cuma" in Turkish. Ever since the year 2000, every November, Harbiye Military Museum hosts the very unique and affirming festival Natural: Body, Mind and Mental Health Festival (in Turkish, Naturel: Beden Zihin ve Ruh Sağlığı Festival). For four full days, this year from Nov. 22 to 25, the festival aims to introduce a wide variety of ecological, physical, mental, artistic and spiritual methods to promote natural living and healing. Participants will get the opportunity to not only learn a variety of holistic practices but also to be introduced to different healthy practices and trainers that abound in Turkey. Each day from 11 a.m. to 7 p.m., there will be dozens of seminars and workshops open to all and the cost to participate is TL 30 per day with tickets available at Harbiye Military Museum entrance.